The fight for freedom has been central to our country since its creation, and it continues today in ways the founders never anticipated. You can explore the significance of freedom at a new exhibition at the Elmhurst History Museum, called Freedom: A History of US. The show runs from Jan. 12 through March 11. At Elmhurst Toyota, we think learning about history is important, and we encourage everyone to see this important exhibit. Freedom: A History of US is a traveling exhibit on loan from the Gilder Lehrman Institute of American History. It features personal letters and documents written by the Americans who created history and helped preserve the freedoms we enjoy today. 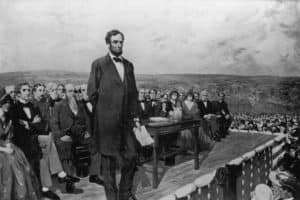 The exhibition includes President Abraham Lincoln’s notes for his celebrated Gettysburg Address, as well as letters written by pivotal historical figures such as Martin Luther King, Jr., Susan B. Anthony, and Frederick Douglass. Also included is a secretly printed draft and official copy of the U.S. Constitution, along with a reproduction of a rare copy of the Declaration of Independence printed in 1776. Freedom: A History of US features additional material from the Elmhurst History Museum, including manuscripts associated with the Elmhurst Fair Housing Ordinance, and letters from area veterans dating back to the Civil War and WWI. Don’t miss this chance to discover the history or our nation’s struggle for freedom, as recounted by the people who lived it. It’s a great way for the entire family to learn about history. Tuesday, Wednesday, Thursday, Friday and Sunday: 1-5 p.m. Call (630) 833-1457 or visit www.elmhursthistory.org.